Picture yourself going on a blind date with someone. Everything is perfect. You two are really hitting it off. And suddenly, in a moment of euphoria, you flash your yellow stained teeth to your date. And everything just goes OFF. If you have ever experienced anything like this, you are not alone. Everybody suffers from teeth staining every now and then. And it is embarrassing beyond imagination. You get very antisocial and lose all your drive for clicking pictures or putting them up on social media because you feel too mortified. Well, guess what? There is a way to fix it. And that too without going anywhere else. We are talking about the teeth whitening lights. These lights use LED bulbs and whitening gels to remove even the oldest and most stubborn stains from your teeth while making them whiter. Take a look at the best teeth whitening lights below and pick yours now. 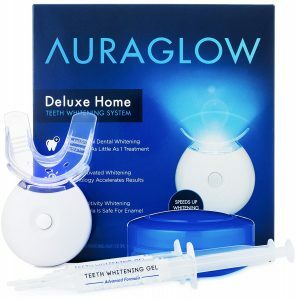 The AuraGlow teeth whitening kit with LED light is the best option for whitening your teeth at home. The LED light that comes with the kit accelerates the whole whitening procedure by activating the power of the gel. There are 5 powerful bulbs in the LED light that provide ample of light and intensity to deliver quick results. There is also an integrated timer in the light along with a beeper. So, every time a session is over the beeper alerts you. The kit also contains a total of 10ml whitening gel that comes in two syringes. The quantity of gel is enough to provide you 20 or even more treatments. And most importantly, the gel is completely safe for your teeth and would not hurt or damage your enamel. One of the best things about this kit is that the tray is already molded. So, you don’t have to waste time on boiling or sculpting the trays. Instead, you can just use the kit whenever you want. The size of the tray has been specially designed to easily fit into your mouth while giving proper grip to your teeth. But, it doesn’t feel uncomfortable at all. And you can use it for both upper and lower teeth simultaneously. The recommended treatment time for this kit is 30 minutes in total. You can use it on daily basis. But, if your teeth are sensitive, you should keep a little gap between your sessions. Once you are done with the treatment, you will definitely see visible results even after the very first use. The AuraGlow teeth whitening kit delivers fast and dramatic results. The LED light of the kit is quite powerful but not powerful enough to destroy the enamel of your teeth. Although it comes with 20 treatments, you will need much lesser than them to achieve your desired whiteness. Integrated timer with a beeper. Prominent results from the very first use. Removes the most stubborn stains from coffee, tea and other such foods and beverages. May cause tooth sensitivity in some people. 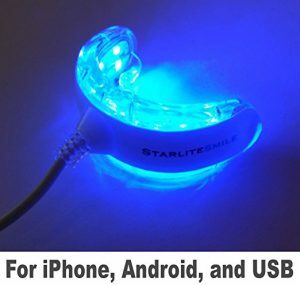 Our second favorite is the Starlite Smile teeth whitening kit that comes with 16 powerful LEDs. And what’s awesome about this kit is that it includes adapters for your androids and iPhones and for USB too. This means you don’t need any batteries to operate it. Isn’t that just so cool? The kit includes a single sculpted tray attached to the unit that tightly fits into your mouth and covers all of your teeth. And the design of the tray is as such that it doesn’t let even the slightest bit of the gel to escape from it. So, your gums are going to be completely safe. The strong LED light accelerates the bleaching power of the gel, resulting in quickly fading out all the stubborn stains. And it also results in delivering quick whitening to your teeth. This versatile teeth whitening light can be used with both whitening gel and whitening strips. So, you can use whatever works best for you, or whatever you are comfortable with. The kit has been made under strict quality standards and is completely safe for your teeth and gums. The teeth whitening kit by Starlite Smile is our favorite because of its ease of use and high level of versatility. The kit doesn’t require any batteries or additional trays and is compatible to all of your phones and USB. And lastly, you can use it with either whitening gels or strips. Completely safe for your teeth and gums. Works with both gels and strips. The tray unit may feel a bit uncomfortable to some people. For those of you, who like to own premium quality teeth whitening light, the Allwithone professional kit would do. With its 16 bulbs, this amazing light provides you professional level teeth whitening right at your home. Even if your teeth have years old stains, this amazing light will fade them away. You can use this kit on a daily basis until you reach your desired results. And it is known to give you a prominently brighter smile in just 7 days. The Allwithone teeth whitening kit is completely safe for your teeth because it doesn’t damage the enamel at all. The suggested duration of its single treatment is 30 minutes. And it is powerful enough to significantly fade away all the major stains in that time, even if it’s your first session. This professional level kit is amazing for those people who are tired of their years’ old teeth stains from smoking, drinking or taking caffeine. Even where all other teeth whitening lights fail to perform, this light stands undefeated. Removes even the most stubborn of teeth stains. Powerful LED light with 16 bulbs. Obvious results in 7 days. Includes auto timer with a beeper. Keeps the tooth enamel safe. The Polar’s whitening LED light is an ideal choice for all of you who are under a tight budget. At a small price of $20, it has all that is needed in a great quality teeth whitening kit. 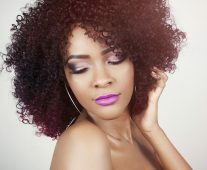 The kit uses 7 powerful LED lights that provide 7 times faster results. One thing that you’ll absolutely love is that it offers hands-free operation. And the 10 minutes auto timer makes the usage even more convenient. The unique thing about this kit is that it uses 15k ultrasonic pulses for whitening your teeth. The ready to use mouth tray that comes with it is soft and provides a firm grip to your teeth, which results in even bleaching. Although the recommended treatment time is 10 minutes, you can take a little additional time if you like. All you need to do is just press the button again and get ready to show off your smile in a few minutes. The Polar Teeth Whitening kit is a very budget friendly option for those who cannot afford very expensive kits. With its amazing results, this simple teeth whitening light is perfect for both first timers and regular users. Quickly activates polar teeth whitening gel. Uses ultrasonic technology with 15k pulses a minute. Our last pick is a bit different from all of the above-mentioned choices because it uses whitening strips instead of the whitening gel and light. So, we’d recommend keeping it as your last option, if you fail to find anything else. The strips deliver quick and promising results. You can see a visible whiteness after the first session. But, you are going to need 2 consecutive treatments for that, which means you’ll need to keep them on for at least an hour. However, for a normal session, you need to keep them on for 30 minutes. Since these strips are quite powerful, once you are done with the treatment, you will most likely suffer from tooth sensitivity and pain. So, if your teeth are already sensitive, you shouldn’t consider this option at all. This option is great if you want a visible whiteness for any recent upcoming event. Otherwise, it’s wise to stick to the LED lights. The Crest 3D Whitestrips are a great option for getting noticeably brighter teeth in just a single treatment. The kit uses a very powerful formula that strips away all the stains from your teeth very efficiently. Removes all the visible stains in just 2 consecutive treatments. Removes decade old teeth stains. Full results in 20 days. What are teeth whitening lights? Teeth whitening lights or LED teeth whitening kits are a very effective way of ridding your teeth of all the dirty stains that they develop over time. And these lights are constantly gaining popularity among people because of their impressive results. There are two different parts in a teeth whitening kit. First, are the trays, that are kept in your mouth and they sort of wrap around your teeth. The second major component is the LED light that lightens your teeth. Let’s dig a little deeper into them. The first part of the kit, the tray, is small in size and is made of soft material. The tray is accompanied by a teeth whitening gel that is filled inside the tray and then the tray is put inside your mouth. The gel used in these kits is generally carbamide peroxide, which is known to lighten your teeth. The trays are carefully designed to snugly fit into your mouth without feeling uncomfortable. Generally, there are different trays for upper and lower teeth, because of their different shapes. There are some teeth whitening lights that also come with paint-on gel instead of trays. The gel is directly applied to the teeth and then they are faced with the light for the required treatment time. The other prime component is the LED light itself, which bleaches your teeth. It doesn’t exactly whiten the teeth itself but quickens the gel’s effect. You would also have heard of this light with the name of LED bleaching light. These lights are quite powerful and penetrating, which is why they deliver such phenomenal results. How these lights work is simple. They enforce the gel’s bleaching ability on your teeth’s surface, which results in lightening your teeth. However, you need to bear in mind that the intensity of the light differs from one kit to another. Some kits deliver strong enough light to make your teeth many tones lighter in just a single prolonged sitting. On the other hand, some kits require several numbers of sessions to give you that kind of whiteness. The advantage of a more intense light is that you can use it on an urgent basis, due to its quick deliverance of results. However, if you are prone to tooth sensitivity, you should opt for a light that works slowly but efficiently. Also, while purchasing your kit, make sure that the package contains the batteries for your light. Instead of randomly starting your whitening session, you should properly plan it ahead. The purpose of planning is to ensure that you have got plenty of time to finish the procedure without anyone’s interruption. The recommended treatment time in these lights also varies from one model to the other one. The suggested time for most of these lights is generally up to 20 minutes for a single treatment. On the other hand, some recommend a time of 15 minutes for a single sitting. The suggested time duration should be followed accurately. Because the time the gel sits on your teeth while being exposed to the LED light, it gets absorbed into your teeth. And overexposing may result in making your teeth sensitive. You also need to understand that the number of total treatments is going to differ for different people, based on the condition of their teeth. So, if your teeth are badly stained due to caffeine or other such foods, you are going to need more sessions to clear that all up. Conversely, people whose teeth are just yellowish without any prominent stains, they are going to need fewer treatments. Another thing to consider while planning is the sensitivity level of your teeth. If your teeth are highly sensitive, you should keep the treatment time shorter while keeping the intensity less. Even though these kits are quite effective at lightening your teeth and removing all the stains, you still need to keep your expectations real. You can’t expect to have pearly whites if your teeth are badly stained and are on a point of no return. In such like case, you obviously won’t be able to see any staggering result. Secondly, you can’t expect to see dramatic results from a single sitting. You need to understand that this is a gradual process and might take multiple treatments until you see any prominent results. However, it does not mean to discourage you in any way or to tell you that they aren’t worth it. They totally are, but you need to be patient and consistent. Before making the purchase, make sure that your chosen light is approved by the FDA and is totally safe to use. The good news is, the majority of such products nowadays are completely safe to be used at home. And they are made of equal standards to professional dental equipment. But still, you cannot completely eliminate the risk of buying a product that is not that safe and may end up harming your teeth and gums. The best way to check their safety is by consulting your dentist. You can simply ask for recommendations or tell him about your preferences. Secondly, your dentist will also know if your teeth are capable of handling the treatment without getting sensitive. So, if he says no, you shouldn’t go for it. Therefore, whatever you do, do not skip this step. 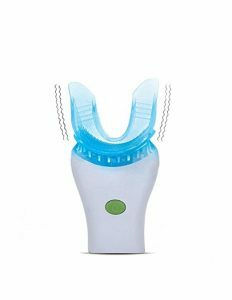 How to use a teeth whitening light? Although the usage of these lights is very simple and easy, you might get a bit confused if you are a newbie and your trays require molding. That’s why we decided to jot it down in steps for you to make it easy and quick. The procedure is very simple and consists of a few easy steps. Please read all the steps carefully and make sure to follow these properly. Also, before every single teeth whitening session, always clean your teeth thoroughly. The procedure starts with boiling some water. Ideally, the pan you are using should have a depth of 4 inches. Once the water is boiled, wait for its temperature to drop. Don’t let it get completely cooled down because you need hot water but it shouldn’t be scalding hot. As the temperature drops a bit, dunk a tray in that water for a few seconds while gripping it from the tap. This will render the tray soft and easily bendable. At this certain point, you have to be highly careful because the tray will begin to bend itself, especially from the corners. This will destroy the shape of the tray. So, make sure it doesn’t happen. Next step is to sculpt your tray. For that, you need to strategically remove it from the water so that it doesn’t twirl. For ensuring that, take it out in an upright position and instantly wrap it all around your teeth and then draw all the air out by sucking it. For better molding of the tray, you can also make use of your fingers or even your tongue. This will easily shape up the tray as per your teeth. But, you’ll have to hurry because you’ll only have a few seconds until the tray gets totally cooled down. But, let us tell you, this might need a little practice. So, most probably, your first try won’t be that successful. Therefore, keep on trying until it fits like a glove. Once you are done with the shaping of the tray and are totally content with it, it’s time to remove the frontal tab of the tray. 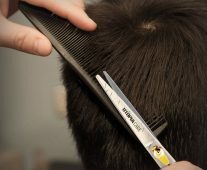 You can easily cut it off using a pair of scissors. Secondly, if the depth of your tray is too much for your teeth, an easy way out would be to remove the upper part of the tray. You have to take this step with due diligence because you wouldn’t want to end up trimming it excessively. And make sure that the tray seamlessly fits your teeth and is not loose from anywhere. If you come to know that your tray hasn’t been sculpted accurately, repeat the previous steps. As we mentioned above, these trays are filled up with whitening gels that need to touch your teeth for starting the action. However, don’t get too generous with the quantity and put a very minimal amount, just about the size of a pea, into the anterior side of the tray. This should be enough to cover your 8-10 frontal teeth. And we are stressing again, do not use a large quantity of gel, just enough to come in contact with your teeth. Some people think that using excessive gel will give them quicker results, but it is not true. The unnecessary quantity of gel may end up irritating your gums. For the same reason, while placing the gel filled tray in your mouth; be very careful not to touch your gums. If, somehow, the gel comes in contact with your gums, wipe it off immediately. Do not take it lightly and put it off for later. You wouldn’t want swollen gums for no reason. Now, keep the tray on for some time. But, if you haven’t done it before, do not keep it on for more than a few minutes, to avoid any discomfort. And then, if you like, you can gradually increase the time duration with every coming session. But, do not go beyond 20-30 minutes in total. And now comes the step that you have bought this whole kit for. That’s right, time to use the LED light! The light is used while the tray is on your teeth. So, as soon as you place the tray inside, turn the light on and place in right in front of the tray. These lights usually have built-in auto timers, so you will not have to turn it off. When the time is up, the light will turn off on its own. But, if you want to keep on doing it for a little longer, you can do so. But remember, not more than 20-30 minutes. Also, clean the tray thoroughly after every use. You can use continue the treatment until you have reached your required results. Once you have attained your desired whiteness, it is suggested to carry out these sessions twice a month. If the first time usage gives you any sort of gum problem, take a break for a week and then again give it a shot. After each session, give your teeth a little break before eating or drinking anything that may result in staining your teeth. For example, coffee, cola, or tea. Ideally, you should wait at least 2 days before coming back to such foods and drinks. If you have highly sensitive teeth, you should get a remineralization/desensitizing gel, apart from your whole kit. This will significantly reduce the sensitivity of your teeth. And if it’s going to be your first time using this light, it’s recommended to have it with your beforehand. This gel is applied after the session has been completed. Once you are done with the light, clean up your tray and put a very minimal amount of desensitizing gel into it. And then put it in your mouth and leave it there for as long as you are comfortable. You can even do this on a regular basis without waiting for your whitening sessions. Your smile is one of the initial things that people notice about you. It can either earn you a lot of admirers or can repulse them off. No matter how gorgeous or handsome you are, if your teeth are yellow and tainted, people are not going to have a good opinion about you. But, luckily, with these teeth whitening lights, you can now get rid of all those stains and yellowness without going to a dentist. And can flaunt your pearly whites to your heartiest desire. Be sure to check out our article on teeth whitening powders that are meant to complement LED light-based methods.